Crispy tortillas filled with spicy chorizo and gooey cheese, these quesadillas are balanced by the fresh, unusual flavor of a radish and fennel salsa. It’s a sophisticated pairing that elevates a familiar comfort food. Note: this recipe also appears on Serious Eats! 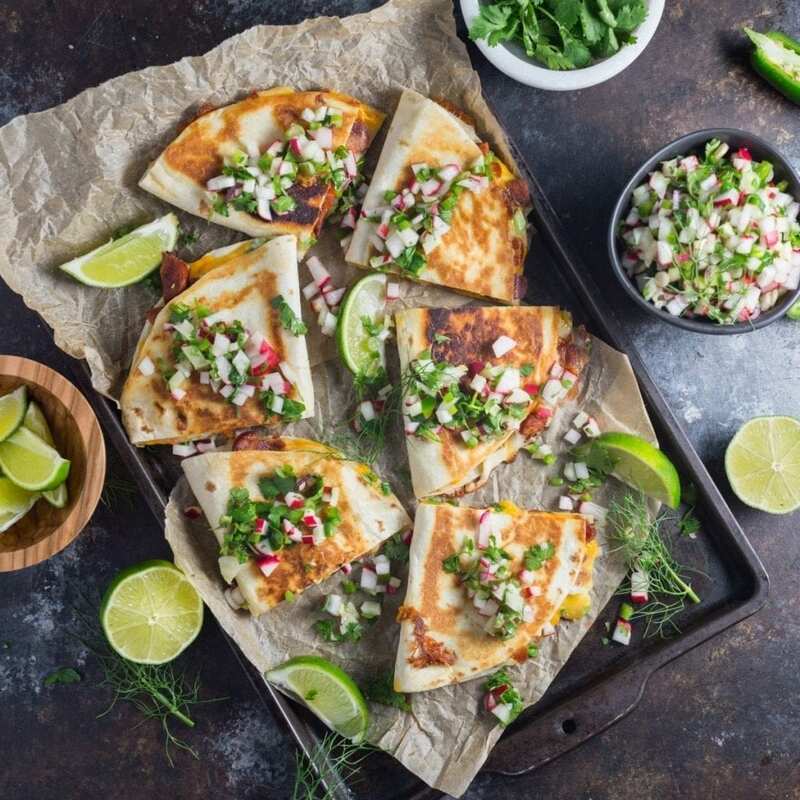 There are days when you absolutely crave a quesadilla that is, in food-marketing parlance, “fully loaded.” But the more ingredients you put in your quesadilla, the more prep work and cooking you have to do, and some nights you just don’t have time for that. To keep this version under 20 minutes, we limited ourselves to two main ingredients in the tortilla itself, and paired it with a tart, crunchy chopped salsa that balances the richness of the quesadilla and elevates it from standard sports-TV fare. It may not be fully loaded with ingredients, but it’s definitely fully loaded with flavor. The meat we’re using is chorizo. This is the cured variety, not fresh, so it doesn’t need a lot of time in the pan. Really, you just need to brown the edges slightly to release its flavor and render some fat. If you can’t find chorizo, any good, highly spiced cured sausage would work. We often use paprika- and garlic-spiked Portuguese linguiça as a substitute. If you have the time and the inclination, adding a few chopped sautéed shrimp to the mix makes a great combination with the chorizo. If you’re looking for a time-saver (and we always are), most decent grocery stores will sell good, real cheese that’s pre-shredded. We love the sharp flavor of cheddar, but it doesn’t melt well, so combining it with Monterey Jack or pepper Jack (Monterey flavored with chilies) gives the dish that gooey melted-cheese texture we want in a quesadilla. You can often find the two cheeses pre-shredded and mixed in a bag or box. If not, grating the cheese should take you only a couple of minutes. Instead of preparing our standard pico de gallo, or a sour cream–based sauce, we wanted to mix it up with a salsa that supplies a crunch to offset the chewy tortillas. More importantly, it also tastes bright and cool. Fennel is perhaps not an ingredient that you’d expect to encounter here, but we love the licorice notes it adds—it holds its own with cool diced radish. Add a little jalapeño pepper (or a lot, depending on how spicy you like your salsa) to finish it off. We generally make quesadillas in one of two ways. You can, if you like, layer one whole tortilla, spoon the filling all over it, then stack another tortilla on top, like a sandwich. But we find it easier to cook and flip a quesadilla if you apply the filling to only half of the tortilla, then fold it over on itself to form a half-moon. You can make this into a one-pan dish by using the same skillet for the tortillas that you used to cook the chorizo. We prefer using a flat cast iron griddle for this (if you have a reversible version, use the flat, non-corrugated side), since it can hold several at once. If you don’t have one, a large cast iron skillet is another good choice. This is one of those dishes that is a little indulgent but also balanced. It’s a treat, but one you won’t regret. Crispy tortillas filled with spicy chorizo and gooey cheese, balanced by the fresh, sophisticated flavor of a radish and fennel salsa. For the Salsa: In a medium bowl, toss together radishes, fennel (plus fronds, if using), scallions, cilantro, jalapeño, and lime juice. Season with salt and pepper to taste. For the Quesadillas: In a large cast iron skillet or on the flat side of a cast iron griddle, heat ½ tablespoon oil over medium-high heat until lightly smoking. Add chorizo and cook until browned, turning once, about 3 minutes. Remove from pan with a slotted spoon onto a paper towel–lined plate. Set out 4 tortillas on a work surface and sprinkle approximately 1 ounce (28g) cheese over half of each tortilla. Scatter chorizo and scallions on top of cheese, then top with remaining cheese. Fold tortillas in half over filling to form a half-moon shape. Add remaining ½ tablespoon oil to skillet or griddle and heat over medium-high heat until lightly smoking. Add quesadillas to skillet or griddle in a single layer, working in batches if necessary. Cook until lightly browned, about 4 minutes. Flip quesadillas and cook until second side is crisp and cheese is fully melted, about 3 minutes. Add more oil as needed if working in batches. While cooking any remaining batches, keep finished quesadillas warm by arranging them on a baking sheet in a single layer and holding them in a 250°F oven. Cut quesadillas into wedges and serve with radish and fennel salsa. Slightly depressed that this wasn’t my Taco Tuesday choice this week. But hey, more to look forward to next week, right!? Totally loving the rich chorizo and fresh radish combo, too. Can’t wait to try these!